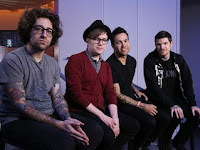 Fall Out Boy have revealed in a new interview that it's possible they might release a new album this January. When speaking to Mixdown Monthly, bassist Pete Wentz confirmed that the band already have five new songs recorded and ten already written. An excerpt from the article with Pete can be found below. So how far along into the new album are you guys? I have about five songs recorded and about ten total writ­ten. So I think we def­i­nitely could have an album out in Jan­u­ary, I would hope. Is ‘Cen­turies’ an indi­ca­tor of what the new stuff will sound like? I think so, in the same way that ‘My Songs Know What You Did in the Dark (Light Em Up) was an indi­ca­tor of the last album, or ‘Sugar, We’re Goin Down’ was an indi­ca­tor of From Under the Cork Tree. Those are the songs that we’ll build a body of work around, but then there will be other things. Like, that’s prob­a­bly the dead cen­tre of the way the record will sound, but there will be other things far to the left of that and far to the right of that. We’ve always been a band that cares about our body of work. Our albums are impor­tant to us. They’re not some­thing to just throw away. So the whole album’s not going to sound like ‘Cen­turies’, but that’s a good indi­ca­tor of where we’re at and what the stuff will sound like son­i­cally. We’ve ben­e­fited from great mix­ers and pro­duc­ers like Butch Walker. Some­times it sounds big­ger when you add less to it. Some­times that’s hard for a young band to wrap their head around.